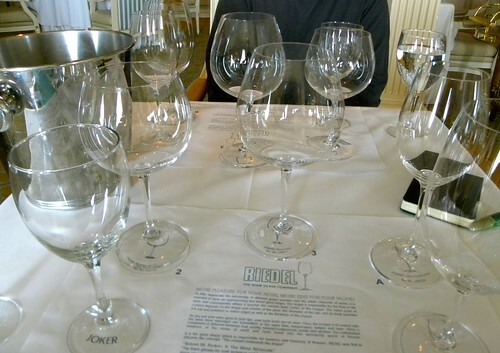 On our last day at sea on the Cruise Ship, we took a Riedel (rhymes with "needle") glassware seminar. It was actually a really interesting seminar, just in the way they forced you to compare the glasses. loudspeaker of the wine, instruments to increase your enjoyment." We started out with 5 different glasses spread out in front of us. 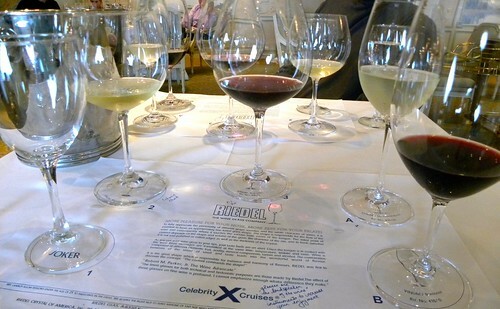 Four of those were from the Riedel Vinum set (Chardonnay, Burgundy/Pinot Noir, Sauvignon Blanc, and Bordeaux). The fifth glass was labeled as the Joker glass (ie, generic) and is the wine glass that was standard throughout the cruise ship and was not Riedel. It's worth noting that every time I've judged a wine competition, we've used similar generic glasses. Needless to say, with all the pouring and switching going on, you really had to pay attention. Riedel uses the idea of a Tongue Map to prove that glassware matters, and that directing wine to a particular part of your tongue makes a difference in what you taste. Now, the Tongue Map has been debunked, although it does have its roots in accuracy. From what I've read, while your tongue isn't strictly laid out in the maps areas, certain taste buds are slightly stronger in these areas as compared to other locations. So while you might pick up acid all over your tongue, it's strongest on the sides. As a general guide, our sommeliers told us that we pick up more acidity on the sides of our tongue, harshness/bitterness towards the back, and sweetness in the front, with weight of a beverage landing in the middle. So did it make a difference? Of course. Keeping in mind that holding a feather-weight, lovely glass in your hand can also influence your perceptions. However, the Estancia Chardonnay tasted soft, with less oak, and full of vanilla when I tasted it in the Vinum Chardonnay glass. When it was moved to the Sauvignon Blanc glass, it had more compressed flavors and higher acidity. I didn't care for it. In the Joker glass, there were no aromas and what had been a decent wine before was suddenly harsh and poorly balanced. It made me consider that perhaps I would like Chardonnay a little more if I drank it out of proper glassware on a regular basis. Perhaps the one that stood out the most for me was the Kendall-Jackson Pinot Noir. I'm not a huge Kendall-Jackson fan, and I admit I scrunched my nose up when they poured the Pinot Noir into my Burgundy glass. The Pinot had soft aromas of earth and vanilla. Supposedly, the glass sent the wine directly to the center of my tongue, so I tasted a Pinot Noir reminiscent of what I smelled: softness, earth, vanilla, with just a hint of oak. Later, the KJ Pinot Noir ended up in the Joker glass and I hated it. I commented to Kevin that this was what I'd expected the Pinot Noir to taste like from the beginning. Again, maybe I should break out my Riedel glassware more often. Another interesting note was on the Bordeaux glass, which we used for an Aussie Shingleback 2005 Shiraz. The Bordeaux glass is what our sommeliers said can serve as the Riedel All-Purpose glass. But they also called it the Tannin Tamer and I experimented with that later at the wine bar. Dump any tannic wine into this glass and it does lessen them to a certain degree – at least in compared to the Joker glass. Although I'd been sold on the concept of glassware making a difference before the Riedel seminar, this excellent demonstration rather drove the point home. I do believe there are elements of visual expectation and psychology involved in it, and I'd drink wine in a paper cup if you gave it to me that way, but glassware does matter. When the iPhone Apps were released back in June, I did a search in the App Store for "wine." What I came up with, at the time, was UrbanSpoon. I immediately downloaded it and it’s still my favorite application. All you do is choose from any number of filters, including type of food, specific location, and price. Lock in your selections, then shake the phone. Yep, shake it like a Magic 8 Ball. The result is a listing of restaurants that meet your criteria. This is a fantastic, random way to try new restaurants. It’s also a great way to settle one of my least favorite arguments: What do you want to eat? Well, I hadn’t realized that UrbanSpoon was more than my favorite iPhone application. Then I’m reading a winemedineme post and I see the little spoon icon at the end. 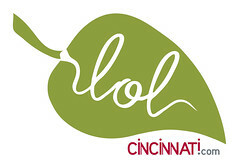 Lo and behold, UrbanSpoon is a pretty nifty restaurant review site as well. within one of my posts (generally having to do with a restaurant) or one of winemedineme‘s posts for that matter, click the spoon icon. You’ll learn more about the restaurant, including critic reviews and information about price, menus, and so on. There are even blog reviews on the site. You can make comments about the restaurant as well, but we’d love you to make the comments on our blogs because we’re stingy like that. UrbanSpoon is just another fun intersection between Web 2.0 and food and wine. So enjoy the social media aspect of being a foodie! first ever Wine Bloggers Conference, it’s all fresh in my mind. My first big find was AbleGrape. and others, I learned more about the search engine. Truthfully, I usually ignore Facebook Apps. I don’t want to hunt vampires or play Scrabble. Honest. I have a lot of fan pages and Causes, but that’s about it. But Green My Vino, by Village Green, combines my bleeding heart causes with an application. In this case, it’s allowing you to give free virtual "gifts" on Facebook. Each one of these gifts is a token for 1-10 minutes of Green Power. Village Green totals the amount of tokens exchanged by folks on Facebook and purchases tht amount of solar energy from specific wind farms and solar arrays. When a certain number is reached, a selected wineries have agreed to power their operations on 100% clean energy. For example, the first winery is Iron Horse Vineyards. Iron Horse will convert when 10,000 tokens have been exchanged. friends are using the similar L’il Green Patch application on Facebook. some greener wineries in the near future. On its face, Green My Vino is just a neat way to engage Facebook users in the efforts of a company to go green. But somewhat behind the scenes, the Green My Vino model directs far more money to the purchase of renewable energy per page view than would be possible with other Facebook application models. Here are the numbers: If Facebook users pass 10,000 minutes to each other, then the first winery will convert their operations to renewable energy. Traditional Facebook applications make money through advertising revenue – so 10,000 minutes passed might result in, let’s say, 20,000 page views. This would generate $20-$100 through ordinary banner adds, and this money could be used to purchase renewable energy. Instead, the wineries involved have made a commitment to do much more. At the 20,000 page view mark, Green My Vino will purchase $3,500 of renewable energy. While an app with traditional banner ads might purchase only 90 kWh of electricity – about what the typical American uses every week, Green My Vino will be purchasing 290,000 kWh – what the typical American uses every 64 years. Are the wineries getting duped? No, the wineries are excited to be a part of the effort and see it as a cost effective way to spread their name and advance a cause they believe in, and Village Green has already received interest from a number of other companies. What’s going on? A couple things. Green My Vino enables people to interact with a brand, rather than be subliminally exposed to it through banner ads. Village Green is focusing on brand interactions instead of page views. Furthermore, this interaction is mutually beneficial – the users help force businesses to use renewable energy and learn about current events in clean energy, while the organizations get noticed for taking a legitimately large step to green their business. And these aren’t monstrous organizations buying a token amount of green power, these are small businesses committing their entire operations. What the businesses involved get as well is a toehold in Facebook. Social media networks are clearly the next step in online interactions and many companies have no idea how or lack the funds to get involved. These smaller businesses get exposure on Facebook for a fraction of the cost of what they would pay otherwise, and because we at Village Green are a bunch of young environmentalists, we make them go green in order to get that exposure. Providing these services to businesses provides a value far beyond banner ads, which directs much more money towards addressing environmental concerns. Thanks to the silly regulations prohibiting liquid on planes, we now have to be creative about bringing back wine when we travel. I found the Wine Skin today via an article on Hi-Tech Travel Gadgets in TIme Magazine online. It’s the simplest little gadget. From what I can tell, someone smarter than me took bubble wrap, shaped it like a wine bottle and added a seal. When you shove your bottles into your suitcase, your clothes are now protected from the wine if it should break. There have been countless times when I have wrapped wine in plastic bags and then in my clothes to protect it. But I’m always a little paranoid – what if it breaks en route and ruins my one designer suit. Or worse, what if it breaks when the TSA is rifling through my bag. They’ve opened my bottles before and left them open. Who is to say they won’t be rough with that bottle of wine I had to have? Back in 2005, Kevin & I went to Sonoma and brought back over a case of wine – in our carry-ons and in our checked luggage. If I’m bringing back that much now, I’ll ship it. But if I’ve just got one or two bottles, the Wine Skin looks like a perfect solution.